Chemical risk identification and mitigation project. Being able to identify, reduce and mitigate the risk posed by weaponizable chemicals and their precursors requires a global effort, and it is one that INTERPOL takes seriously. 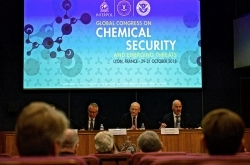 Through developing a risk matrix of the most significant chemicals of concern, we work with member countries’ government, law enforcement and chemical industry partners to assist in a tailored programme of sustainable, focused, chemical security countermeasures supported by industry partners. Based on their local non-state actor threat, Project Crimp provides a platform for multi-agency cooperation between law enforcement, government, academia and the chemical industry to share knowledge, experience and identify solutions. A critical element to the countermeasures programme includes a communications outreach component with the use of strategic media and communications tools contributing to a holistic approach and bolsters security throughout the lifecycle of chemicals of concern and their precursors. Project Crimp was delivered to Iraqi authorities in 2018. The first part of the training course produced the risk matrix of chemicals of specific concern to the country. It also identified areas of good practice, duplication of effort and potential vulnerabilities, and started to develop the multi-agency team that will oversee future activity. The second part continued building the working group to implement countermeasures and began the implementation. Overall, the programme allowed delegates to review their chemical security capabilities. They showcased areas of best practice in Iraq that have been shared with INTERPOL member countries, along with existing countermeasures that assist in safeguarding the people of Iraq. Public awareness was a key area of activity. A number of initiatives – such as school visits − have been enhanced to include information about chemical security, and retailers are being reminded about reporting any suspicious activity to government hotlines. The Civil Defence CBRNE Unit hosted a number of multi-agency simulation days where they showcased their skills in dealing with casualties who have been exposed to dangerous chemicals, and in decontaminating the area to allow a swift return to normality for the community.